The New York Guitar Festival is returning to various NYC venues this year from January 10 to January 30. It features a number of shows, including Nels Cline at Drama League Theater Center (1/18), Fred Frith meets Nels Cline at SubCulture (1/18), Ben Monder and others at Drama League Theater Center (1/19), Marc Ribot and Chris Eldridge at Merkin Concert Hall (1/21), Badi Assad and Kaki King at Merkin Concert Hall (1/23), Toubab Krewe and Joseph Arthur at Merkin Concert Hall (1/30), and more. Tickets for each paid show (some are free) are available at venue websites. Head to NY Guitar Fest’s site for appropriate links and more details. Pepe Romero’s distinguished career, both as a solo performer and charter member of the “Royal Family of the Guitar,” encompasses some 60 albums, multiple White House invitations, Carnegie Hall concerts, and world premieres by Rodrigo and Moreno Torroba, in addition to receiving a Knighthood by King Juan Carlos I of Spain. This New York Guitar Festival appearance marks Romero’s first ever all-Bach recital in New York. Touring the world in celebration of his 70th year, Romero will give his only New York concert this season at the New York Guitar Festival. An evening of trios that explore evolving concepts of rhythm, curated by Joel Harrison. • Jazz/funk electronica with Will Bernard and the Pleasure Drones. • Miles Okazaki with James Hurt (percussion) and Sergio Krakowski, pandeiro (Brazilian frame drum). • Liberty Ellman, master of contrapuntal rhythms, with Matt Brewer, bass, and Damion Reid, drums. • David Gilmore with Gene Lake (drums), Brad Jones (bass). Nels Cline will demonstrate how he achieves his unique sound world where all conceivable musical roads converge. This is Cline’s first such class in New York City. All levels invited. “Feel the Noise!” – curated by Joel Harrison. •Dave Tronzo with Stomu Takeishi, electric bass, and Ben Perowsky, percussion. Five modern masters discuss new approaches to jazz guitar through the lens of Paul Motian’s music. Ben Monder, Steve Cardenas (both Motian alumni), Vic Juris, Liberty Ellman, and Joel Harrison will talk about comping, ensemble playing, linear improvisation, band-leading, electronics, philosophy, and more, using Paul Motian’s singular opus as a starting point. All levels invited. When drummer, bandleader, and composer Paul Motian died at age 80 in the autumn of 2011, it was, for jazz critic Steve Futterman writing in The New Yorker, “like waking to find that your favorite neighborhood bookstore–the one that stocked the edgy stuff that no one else would touch–had closed overnight.” Motian’s music lives on in duo performances by Steve Cardenas and Jacob Sacks, Ben Monder and Bill McHenry (Motian band alums) Gilad Hekselman and Jeff Ballard, Brandon Ross and Stomu Takeishi, Vic Juris and Mary Halvorson, the Nels Cline & Julian Lage Duo, and Joel Harrison and Tyshawn Sorey. FREE for the first time in our Festival’s history, this six-hour Marathon (taking place on MLK Day) celebrates the classical guitar in North and South America, contrasting rich traditions with bold experimentation. “Marc Ribot did such a fabulous job with Chaplin’s classic The Kid at the 2010 Festival,” NYGF Founder David Spelman remembers, “bringing out not just the humor, but the deep humanity of the film, that I knew we wanted to have him back, but this time with a film that might summon up an even wider emotional palette.” This season, Ribot returns with a new score for Joseph von Sternberg’s passionate 1928 drama The Docks of New York, which tells the New York waterfront story of a boiler room stoker’s romance with a suicidal dance-hall girl. Ribot has frequently collaborated with Tom Waits and John Zorn; his most recent band is the trio Ceramic Dog. The extraordinary Brazilian guitarist/singer Badi Assad premieres her score for one of the best-known films of China’s cinematic golden age: Wu Yonggang’s 1934 debut The Goddess, the story of a prostitute working the seamy streets of Shanghai to afford an education for her young son. 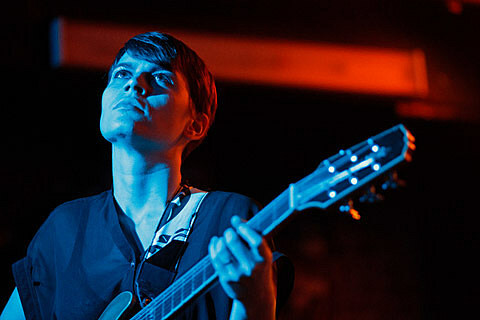 With six albums as well as collaborations with Eddie Vedder, Foo Fighters, and The Mountain Goats to her credit, Kaki King brings her spare, understated style to Arbuckle’s 1920 short comedy The Garage. Formerly lead guitarist with The Black Crowes and current front-man for North Mississippi Allstars, Memphis-born Luther Dickinson deploys his aggressively Southern sensibility to Walter Ruttman’s 1927 documentary portrait of a Berlin long gone by, Berlin: Symphony of a Great City. A painter and a chamber musician before becoming a filmmaker, Ruttman cast an impressionistic eye over a single day-into-night of life observed in the German capital. The West African-inspired Asheville, North Carolina-based ensemble Toubab Krewe plays Malian-accented world-pop that’s imbued with laconic, Southeastern minimalism. Their cross-cultural flair will take a turn to the East as the band premieres an original score to Japanese director Yasujirô Ozu’s boisterous 1932 comedy I Was Born, but…. Two young brothers, outsiders in a new town, skip school to dodge a bully and fret over their father’s lowly social standing as an office clerk. Grammy-nominated singer-songwriter Joseph Arthur tunes his jangly, pop guitar to “Fatty” Arbuckle’s 1917 comedy Oh Doctor! with Arbuckle taking the lead as Dr. Holepoke. Once again, Buster Keaton contributes a share in slapstick mayhem.